Sacramento Northern 654 is a 65-ton, steeple-cab, locomotive built by General Electric in 1930. SN 654 was ordered at the same time as 652 and 653, but its delivery was delayed two years. By time it was delivered the Sacramento Northern Railroad and San Francisco –Sacramento merger had already taken place and it was delivered as SN 654. 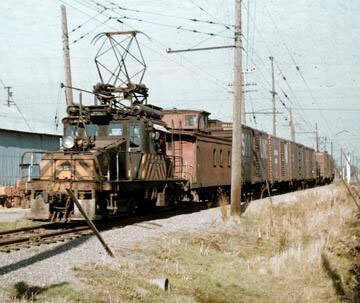 At some point it received the trucks from SN 670, which was the former Tidewater Southern motor 106 (GE May 1921, builder number 8438) that SN purchased second hand. Evidence uncovered at the Museum indicates that 654 was involved in an accident serious enough at some point in its life to require the replacement of one entire side sill. 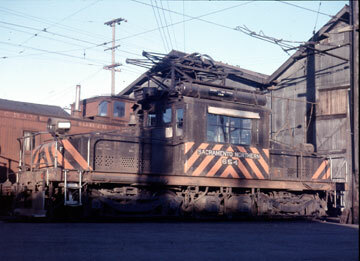 It was in service on the Sacramento Northern until the end of electric operation in 1965. 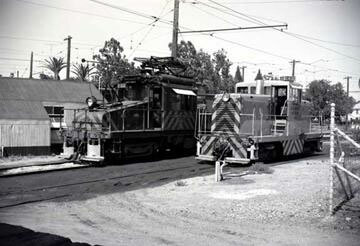 Vintage Caption: SN #654 at 40th and Shafter in Oakland. 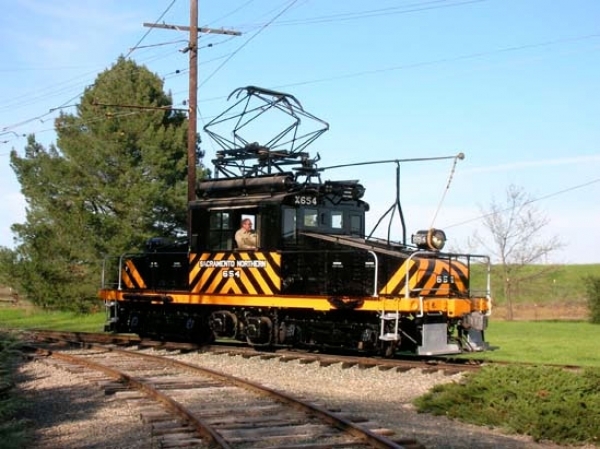 Technical Data: Steeple cab locomotive. Built by General Electric at Erie Works in 1930. Builder number 10609. Weight 126,640 pounds. 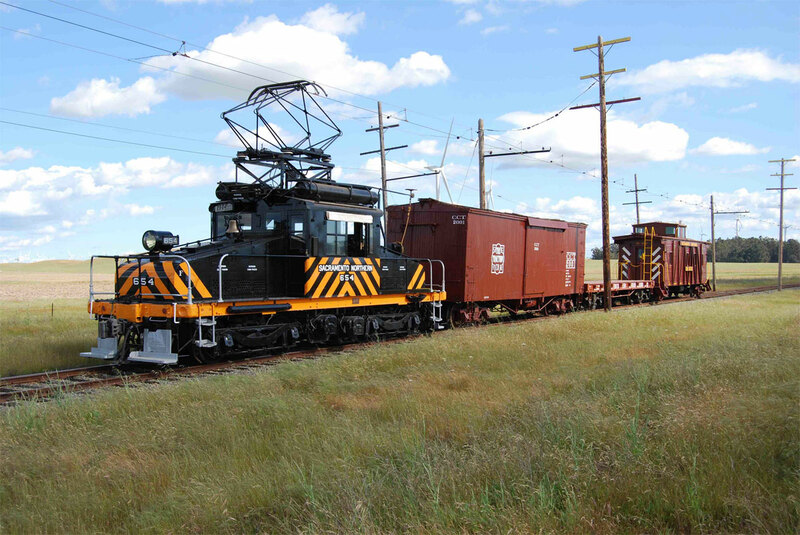 Trucks: ALCO RM-63. Wheels, 36 inch steel. Axle. Journals, 5 1/2 X 10 plain bearing. Traction motors, 4-212 horsepower @600 VDC, inside hung. Dimensions: Width, 9’ 7”. Length, 38’ 8”. Height. Truck centers. Truck wheelbase. Propulsion Equipment: General Electric. Master controller, C-168. Switch group. Reverser. Traction motors, GE 251A 600/1200 volt. Gearing, bull 69 tooth, pinion 17 tooth, ratio 4.06 to 1,? face. Control switch. Power resistors. Dynamotor. Misc Data: Couplers, AAR knuckle couplers. Pantograph, Westinghouse S-514-A. Trolley wheel, Kalamazoo 6”. Trolley base, US-13. Whistle, General Electric. Horn, Westinghouse pneumonic. Bell, one air ringer, one 15” locomotive bell. Current Condition: Complete and operational. Excellent condition. Proposed Future Treatment: Currently this locomotive is being painted. Maintain in good condition. Photo 1 Caption: SN 654 with SN 146.